The Medieval Times encompass one of the most exciting periods in the History of England and Europe. The names of many famous Medieval women scatter the Medieval History books and other historical documents - they were mostly queens and princesses. But what about the women who were not of noble birth? Who were these Medieval women who became famous despite the dominance of men during this era? The following biography, short history and interesting facts provide helpful information for history courses and history coursework about the key dates and events in the life of Heloise who was famous as the lover of Peter Abelard. Their tragic love story culminated in the castration of Peter Abelard (1079-1142). Nearly six hundred years after the deaths of Peter Abelard and Heloise Josephine Bonaparte ordered that the remains of Abelard and Heloise be entombed together at the Pere Lachaise cemetery in Paris in 1817. The love affair between Peter Abelard and Heloise: As a teacher at the Notre Dame University Peter Abelard had sworn a vow of celibacy he was therefore in a position of total trust. Their love affair started at the home of Abbot Fulbert, the uncle of Heloise. Abbot Fulbert eventually discovered that they were lovers. Abelard and Heloise were parted. But Heloise was pregnant. The couple fled to the family home of Peter Abelard. It was unknown for scholars to wed as a wife and family would be a serious impediment to an academic career. The couple had a son. Peter and Heloise returned to Paris and were married in secret. They lived separately keeping up a pretence that their affair had finished. Heloise was sent to the Convent of Saint Mary in Argenteuil - but although she wore the clothes of a nun she did not take the veil. Fulbert was furious and sought revenge on Peter Abelard. As a terrible retribution for his affair with Heloise Peter was attacked in Paris and castrated. He then turned to the Dominican order, entered the abbey of St. Denis and became a monk. Heloise had no alternative but to take the veil, become a nun and give up her son. The Convent of Saint Mary in Argenteuil was taken over and Heloise moved to the convent Paraclete where she became the abbess. 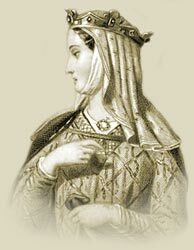 Peter Abelard and Heloise wrote many letters to each other and although their physical relationship had ended Heloise encourage Peter Abelard in his career. They loved each of until the end of their days. Interesting facts and information with a short biography about the Medieval Life, Times and history of Heloise. Additional useful details, facts, history, biography, timeline and information about the lives of other famous people of the Dark Ages and Middle Ages, and the important events which occurred during their times, can be accessed via the Medieval Life and Times Sitemap. The content of this article on Medieval life and times provides free educational details, facts and information for reference and research for schools, colleges and homework for history courses and history coursework.